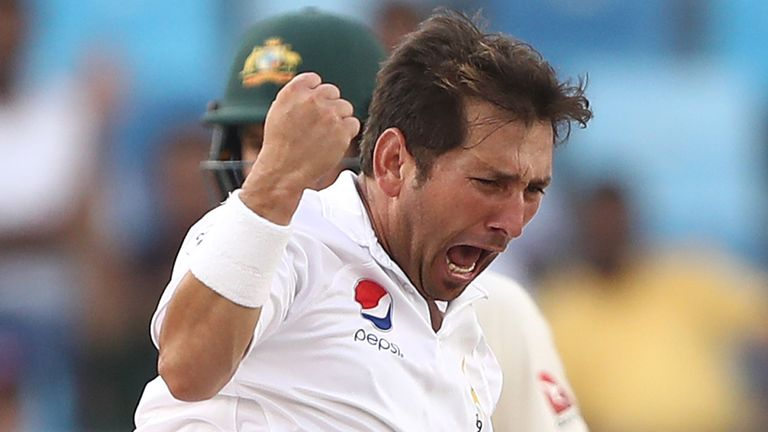 Yasir Shah spoke to Saj (for Sky Sports) about his return to Pakistan's Test side after a year, his hopes for next year's World Cup and the drawn Test between Pakistan and Australia in Dubai. Pakistan's Test tour of Ireland and England in the summer of 2018 was hailed as a success as the team lead by Sarfaraz Ahmed came away unscathed with a victory in the one-off match in Ireland and a drawn series against England on their home turf. This was a commendable result in many ways and had special significance given the absence of their star bowler Yasir Shah, who had been a key part of their success in the 2016 series in England. Now restored to full fitness but lacking match practice, Shah performed admirably in the recently concluded first Test against Australia which was played in Dubai. Having last played for Pakistan against Sri Lanka at the same venue in October 2017, the leg-spinner made a much-awaited return to the Test arena and explained why he was happy with the way things went for him during the recently concluded match against Australia. "I am very happy with my comeback into international cricket after almost a year," Yasir said. "Of course, when you start playing Test cricket again after such a long period, there are always problems but thankfully, my form seems to have returned to normal as I feel that I bowled really well during the second innings against Australia. "I am hoping that this will continue in the rest of the series and into the future." The UAE has had a reputation as an impregnable fortress for Pakistan in Tests and Yasir's performances have had a major role in establishing this trend, but he did not taste as much success as expected in the hard-fought match against Australia, which may have left a few question marks over his form and fitness. However, the leg-spinner disagreed with this assessment and expressed his satisfaction with how he performed given that he was returning to top-level cricket after an absence of almost a year. "I am aware of the continued expectations on me as far as bowling in UAE is concerned but one needs to take into account the fact that I was making a comeback after a long time," he explained. "Of course, the fact that I missed a caught-and-bowled chance in the first innings didn't really help my cause and there were other missed chances also off my bowling so in a way I was unlucky to not get more wickets. "However, my aim was to get my basics right and get my rhythm back and I feel satisfied that I achieved that objective in the second innings and was eventually able to bowl in the same way I have bowled before in UAE." Reduced to 87-3 on day four of the first Test, not many pundits gave Australia much of a chance of survival but Usman Khawaja's epic 141-run knock defied Pakistan's bowling attack and also helped the tourists in securing a nail-biting draw in Dubai. Yasir, who took four wickets in the second innings to give Pakistan a whiff of victory in the dying moments of the Test match, had a lot of praise for the Australian batsman. "Khawaja excelled in the way he batted against us on that final day of the first Test in Dubai," he said. "I wouldn't say it was difficult to bowl to him or that I bowled badly, but you must give credit to him as he found a way to tackle my bowling by playing some unbelievable sweep and reverse-sweep shots without too much difficulty." The first Test against Australia also brought to the fore a debutante for Pakistan, Bilal Asif, who impressed with a six-wicket haul in the first innings. However, the off-spinner from Sialkot was unable to repeat his performance in the second innings which Yasir simply attributed to a lack of international experience. "Bilal Asif bowled really well in the first innings against Australia in his debut game in Dubai recently," the 32-year-old said. "I feel that as he gets to bowl more on surfaces as the one in Dubai, he will get to learn a bit more about what is needed to be effective on such wickets and will only get better with more matches under his belt. "To be honest, one cannot really be too harsh on Bilal for his bowling in the second innings as even I was shocked by the Dubai pitch on the fifth day which seemed to be very slow and easy-paced." Shadab Khan has seen a lot of success in the limited over formats for Pakistan and was also chosen to fill-in for an injured Yasir during the tour of England. "Shadab is an excellent young leg-spinner who I feel can perform really well in Test cricket," he added. "Apart from being a good bowler, he can also bat well and has done wonders for our team in ODIs and T20I games. "If given a chance, I think he has the potential to put in some excellent performance in Tests as well in future." Fresh from his excellent season at Leicestershire, Pakistan pace-bowler Mohammad Abbas wasted no time in showing why he is considered his country's leading fast-bowler. He ripped apart the Australian batting line-up in the first innings of the first Test, on a surface not considered helpful for his style of bowling. Yasir, like many others, was in awe of the fast bowler's performance: "Mohammad Abbas has really impressed me in all the matches he has played for Pakistan so far. "Since his debut in 2017, he has continuously improved himself and demonstrated his wicket-taking skills as he did on the England tour where he was the highest wicket-taker in the Test series. "He bowled wonderfully well in the match against Australia too and gave us a great chance of victory and I am sure he will continue to prove to be a good fast-bowler for Pakistan in the future." The 2019 World Cup in England promises to be an interesting contest and the 2017 Champions Trophy winners, Pakistan, are expected to put up a stiff challenge for a bid to become world champions. While Shadab has been the leg-spinner of choice for Pakistan in ODIs in recent times, Yasir - who has played 19 ODIs for his country - still hasn't given up hope of a spot in the World Cup squad. "ODI cricket is something I take seriously and is one format for which I would like to make a comeback for Pakistan in the future," he said. "I have been participating in one-day games in domestic cricket, with the intention of proving my capabilities in this form of cricket so that I can make a comeback and possibly put myself in contention for a spot in Pakistan's 2019 World Cup squad." After opting out of red-ball cricket for Yorkshire, Adil Rashid surprised many observers with his inclusion in the England Test squad which comfortably defeated India. His performances, however, were no shock to Yasir who is a great admirer of the England and Yorkshire leg-spin bowler. "I've always felt that Rashid is an impressive leg-spinner and I was not surprised that he was successful during the Test series against India in the summer," the right-hander said. "He has a good googly and flipper in his arsenal and is a hard-working bowler. I rate Adil very highly amongst all of the leg-spinners I have seen, and I feel that he is likely to have much more success in the future for England." A masterful proponent of one of cricket's most beautiful styles of bowling, Yasir has shown time and again how important a leg-spinner is to the overall success of his team. With an impressive tally of 169 Test wickets to his name in only 29 matches, it is no surprise that the Pakistan bowler feels that leg-spin is an important component of any team line-up and its effectiveness is not just limited to Tests alone. "The state of leg-spin bowling is very encouraging at the moment in international cricket," Yasir said. "There was a period after Shane Warne where there seemed to be a shortage of good leg-spinners in international cricket. "It appeared that there was little or no use for this style of bowling in ODIs or T20I games, but all that has changed recently. "We now have a situation where there are very good and successful leg-spinners in each format of the game and that is simply because of the realisation that this sort of bowler is a wicket-taker and a game-changer in any form of the game. "This is all great news for the art of leg-spin and I hope this will continue for a long time in the future."